We're taking a look at the full list of perks in Elder Scrolls: Blades! Whether you are slinging spells or wielding steel, you are going to want to know the full list of perks in Elder Scrolls: Blades! Perks are things that are passively enabled to boost your damage, defenses, resistances, and can even upgrade your inventory size. Warrior and Mages alike will want to focus on upgrading their perks when possible. You can upgrade your spell damage as a Mage, or get more damage out of whatever weapon you are swinging. Perks use the same skill points that you will use to unlock spells and abilities. Stats are based upon the first level of the perk, the stats will change when upgraded. 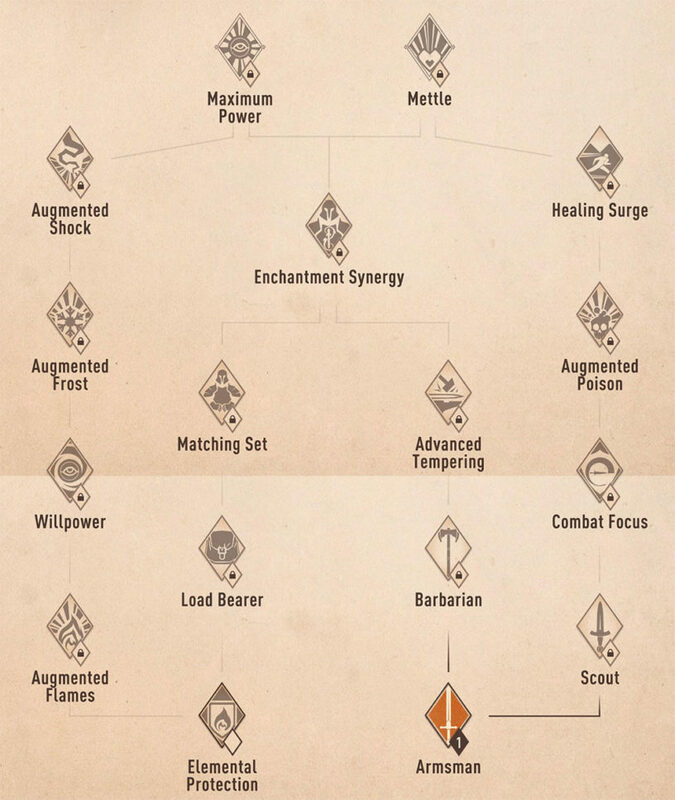 There's kind of two sides of the tree with perks, the left side is more magic oriented and the right side is more for players looking to upgrade their damage with weapons. Down the middle is a little more varied, you can upgrade your inventory and your blacksmith's ability to temper. +33 Block Rating against elemental damage while blocking with a shield. +4 Damage with versatile weapons (longswords, war axes, and maces). Increases fire damage by 6. +4 Damage with light weapons (daggers, hand axes, and light hammers). Increases inventory size by 10. +7 Damage with heavy weapons (greatswords, battleaxes, and warhammers). Recover up to 50 points of the Magicka spent on an interrupted spell. +7 Resistance to all damage while using an ability. +58 Armor Rating while wearing a matched set of armor (armor, helmet, gauntlets, and boots). Increases the Smithy's maximum tempering level by 2, up to level 6. Increases frost damage by 8. Increases poison damage by 9. Stacked enchantments are 5% more effective. Increases shock damage by 11. Increases Health regeneration while Stamina is high, by up to 9 per second. Spells are 10% more effective when cast while Magicka is full. Abilities are 10% more effective Health is critical.